What on earth is a DPR you may ask – quite rightly – and the answer is: “Device for Preventing Rotation” and a very useful “widget” to help panel builders locate locks securely in non-metal doors – a regular problem, we are told, for users/specifiers of non-standard cabinets particularly with insulated or GRP doors and panels. 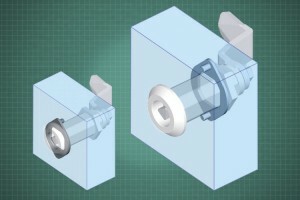 The device allows simple punching/cutting of a round hole with the ability then to fit this anti-rotational adapter which provides secure location for a standard EMKA lock with its rounded corner square body. Share the post "DPR secures locks in round holes"